It’s huge, it’s fast and the only one in Fiji! Imagine – you climb into the forest canopy to your take-off position then, after a deep breath, you’re suddenly rushing downhill propelled by a river of water flowing at over 25 liters a SECOND! At over 100 meters (325+ feet) long and almost 15 meters (50 feet) high, Kula’s Splash Mountain Jungle Slide is a thrilling, high speed, wet & wild plunge through the forest. This state of the art open body slide is powered by huge pumps that deliver over 70,000 liters of water per hour to the top of the slide. It’s like having your own personal waterfall to ride. As you plunge down the hillside you’ll spin around loops and turns, feel the ‘G’ in the corners and watch the blur of the forest as the world rushes by. Suddenly you’ll be flying overhead your family & friends as you cross the river and splash down at the Landing Island on the other side. You’re guaranteed to be wearing a huge smile when you land and we’re willing to bet that one ride just isn’t enough! 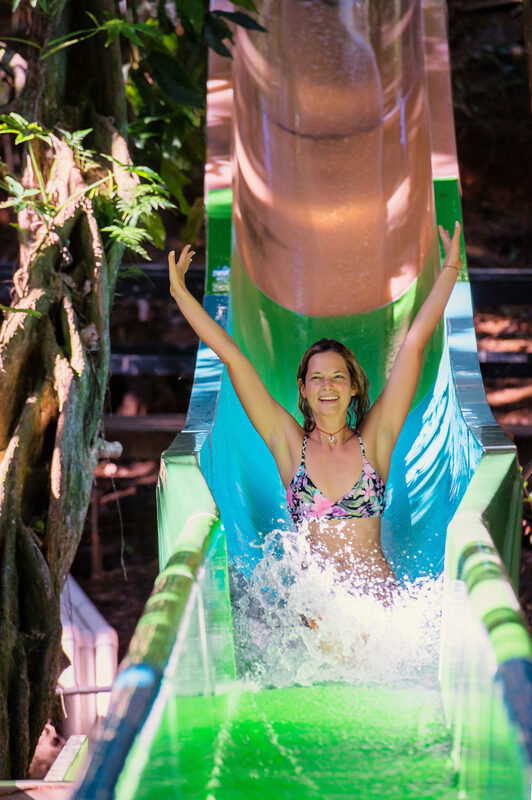 Kula’s Jungle Slide operates 7 days a week in all weather except high winds, so bring your swimmers and be prepared for the wettest rush of a lifetime. Minimum Krazy Flier Rider weight 35kg. Maximum Krazy Flier Rider weight 120kg. Minimum Jungle Slide rider height 1.05 meters. Maximum Jungle Slide rider 120 kg. Krazy Flier riders must wear closed shoes plus the safety gear provided and follow all safety instructions. Jungle Slide riders must wear swimmers only and follow all safety instructions.